Our wide choice of contemporary bar furniture coming in different colors and designs offers you a variety of great options from which to choose. These attractive pieces of furniture are excellent for mixing and serving drinks and storing wine and other spirits. 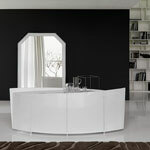 We offering the finest Italian designer bar units at discounted prices.